SunCatcher Pontoons, built in Lebanon, MO, offer models from 16 to 26 feet with fishing layouts, cruising layouts and everything in between. Nestled in between their high end Elite series and their value focused V series you can find the X Series. With 6 models in the X Series, I had the chance to test out the 2017 SunCatcher X 324 SS. When it comes to boat names you can tell a lot by the numbers. Usually it refers to the length of the boat, and in the case of the X 324 SS it does, but this boat isn’t 32 feet long. The 3 in the name refers the fact that this model has a triple log pontoon configuration. So it’s a triple log, 24-foot long pontoon. Well, 23-feet, 11-inches but what’s an inch among friends. The X 324 SS is the perfect combination of sporty performance and comfort. The standout features on this model are the four full length, chaise style loungers. At the stern of the boat you will find twin, full length loungers. These rear-facing seats are like oversized la-z-boy recliners as they swallow you up in comfort. There are armrests on each side of the lounger and each one has a drink holder. I like this because one of them can hold your drink while the other can hold your sunglasses. Normally you would put a cellphone in there but each lounger has a cellphone tray tucked down by the side. There is a charge port there as well, clever and convenient. 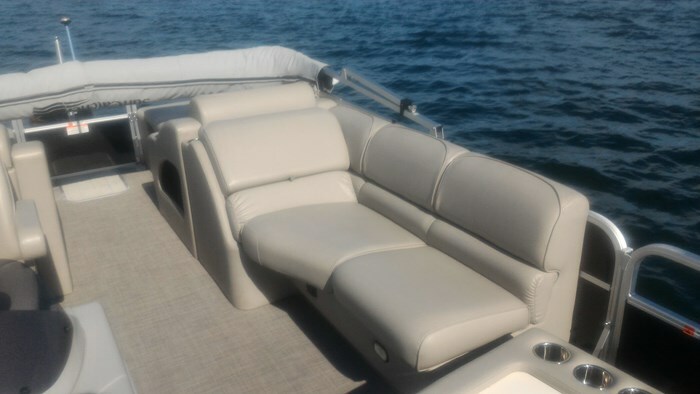 Under the port side lounger you will find a large storage bin as the cushion hinges completely vertical, given you complete access to the bin. Usually with storage compartments, the seat base interferes with the access, not giving you as much access as you think. In this case you get full access which makes this quite functional. Under the portside rear lounger you will find the privacy curtain, perfect for changing in to or out of swimsuits. What I like about placing it under this lounger is that it doesn’t interfere with any part of the floor. 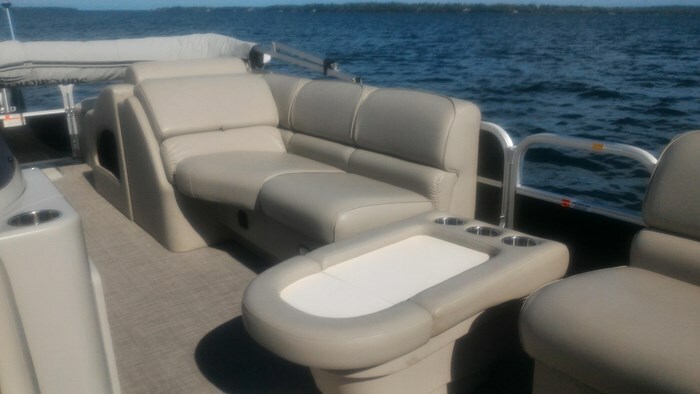 What I mean by this is that on some pontoons, the change area is put into the seat back of a lounger and it usually opens up into the boat, blocking the portside gate. It’s a minor thing, but I think it makes a difference. The helm on the X 324 SS is clean and functional. 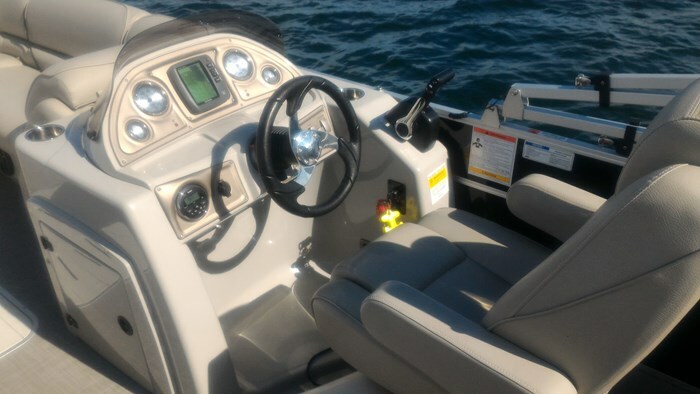 It features a full fiberglass helm stand, full gauge package, tilt steering and rocker switches. The fourth of these loungers can be found on the starboard side of the bow grouping. 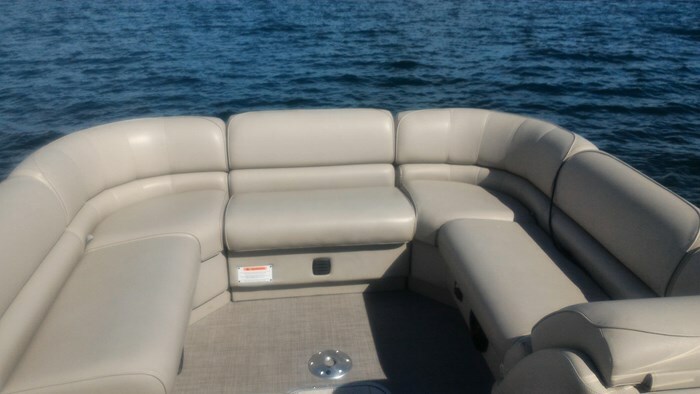 Across from it is a more traditional pontoon bench seat. There’s no rules that say you couldn’t kick your feet up and relax on this bad boy either. But for classification purposes, it doesn’t fall under the “Lounger” section. Under all three of the aforementioned seats you will find rotocast storage compartments. These are big enough for life vests, water toys, beach bags or anything else you could toss in there. What’s nice about these is they all have rain channels on the top of the compartments. These small little channels, catch water as it drips down through the seats. Instead of falling into the compartment, making it damp and moldy, they settle into the channel then drain into the pontoons. Your gear stays fresh and dry and life jackets that live under there aren’t sentenced to a life of mold. 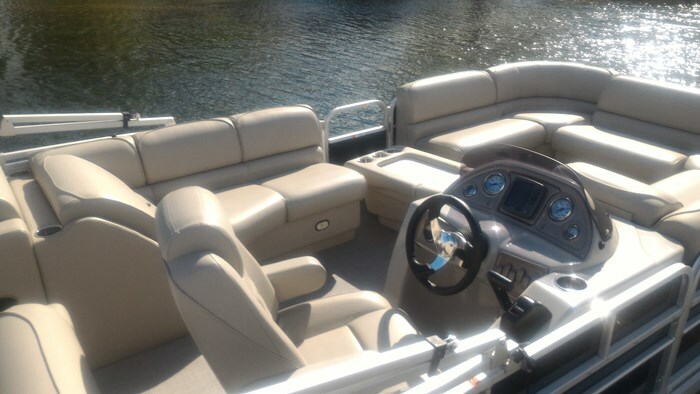 One of the added benefits of having a triple pontoon is you get the in floor locker, just like traditional runabouts. This is great for larger items like water skis or tubes or kids that are misbehaving. I’m kidding obviously - there’s no way an inflated tube could fit in there. Finally for those cold bevys the cooler can fit under the helm. If you’re not familiar with G3’s SunCatcher Pontoons, something they do differently than their competition is they use U-shaped pontoons rather than round. What they do is bolt the cross-members directly to the top of the logs, rather than relying on riser brackets. If you think about it, the more direct contact you can make to something, the more secure it is. Why the competition doesn’t do this is because it is more labour intensive to build the logs this way. The result of this is a smooth and very secure ride out on the water. I had a slight chop thanks to the breeze on this late September test day, so it was a great time to test the U-shaped logs on the x 324 SS. 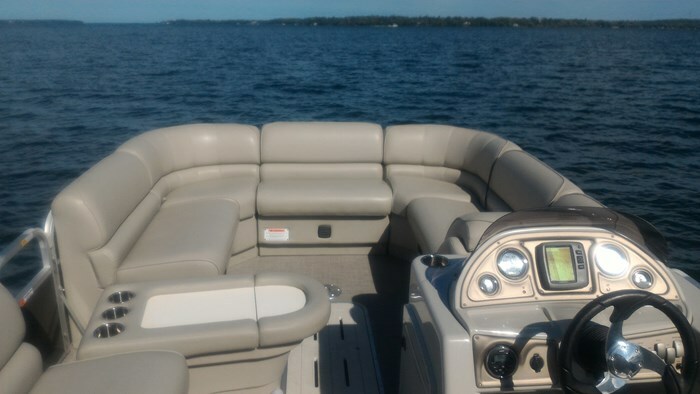 I’ve tested many SunCatcher pontoons in the past and as predicted, the ride was very smooth, like you’re riding in a Lincoln Town Car to the airport. I skipped across the top of the light chop, and the Yamaha Vmax SHO 150 powering this X 324 provided ample acceleration, getting the package to 20 mph in three and a half seconds. 20 mph was an easy 3500 rpm for the SHO. Making 500 rpm increments jumps we climbed to 23.75, 27 and finally 32.1 mph at 5000 rpm. Most 24 foot pontoons powered by a 150, this would be their top end speed, but not when you have a Super High Output four stroke powering you. 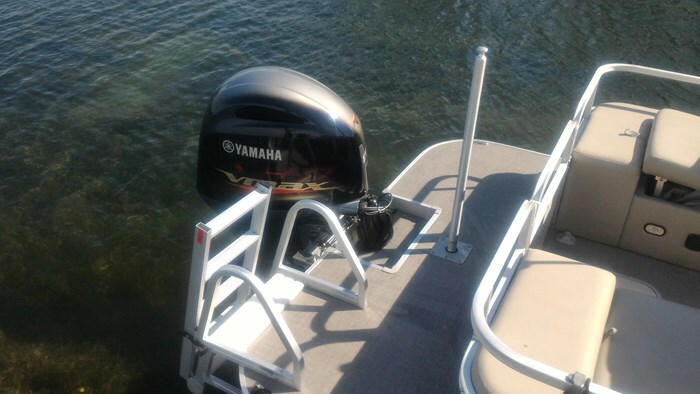 Yamaha’s max RPM for all of their engines is 6000 rpm, so just like clockwork, that’s where wide open throttle hit, and we registered a speed of 38.6 mph. That’s quite impressive. This means you can easily go slalom skiing, wake boarding or tow multiple tubes. It’s nice to be able to journey to the far end of the lake and still make it home in good time if the weather changes in a moment. When you go to the model page for the X 324 SS on the SunCatcher website they put in the description: “giving you the freedom to loosen the ties with land-bound concerns” and it finishes with “life is better on the water.” I couldn’t agree more and I would be more than happy to spend that time on the water in a SunCatcher X 324 SS.